The Montrose, Colorado, adobes. I'm atop Flattop and looking north. The new parking area in the Gunnison Gorge NCA makes the adobes more accessible. I took this from a marked trail atop the adobes, looking east with the sun behind me. Gunnison Gorge National Conservation Area sports a new parking lot designed specifically for dirt bikers who want to ride in the adobe formations north of Montrose. Further, the road all the way to the parking area has been graveled so it can be traveled should it begin to rain. This makes it easier for those who want to explore deep into the adobes. The photo below shows the new parking area. Also provided is a GPS map to help you find it from Montrose. Here's the new parking area in Gunnison Gorge NCA. See GPS map for details. It's reached by traveling north on 6530 Rd from Montrose. The parking lot can be reached from the same road used to reach the Flattop riding area, except keep going straight. The street to take from Montrose going north is 6530 Rd, then travel all the way north without making any turns. At the bottom of this post is a GPS track that shows how to get from US Hwy 50 to both the Flattop Open Riding Area and the trails-only (but with a million trails) Gunnison Gorge NCA. The picture above shows the new parking area. Note 10 parking places for vehicles with trailers plus other parking for vehicles without trailers. There’s a new pit toilet and a sign with dire warnings to please stay on marked, named trails, although one never knows exactly where he/she is atop the adobes because the trails are marked only occasionally. More than half of the trails follow the ridge lines. Here’s the promised GPS map, showing how to get from Montrose to the two official parking areas in the adobes. You'll see the new parking area on Elephant Skin Road near the top. Notice also the parking area for the Flattop open riding area. 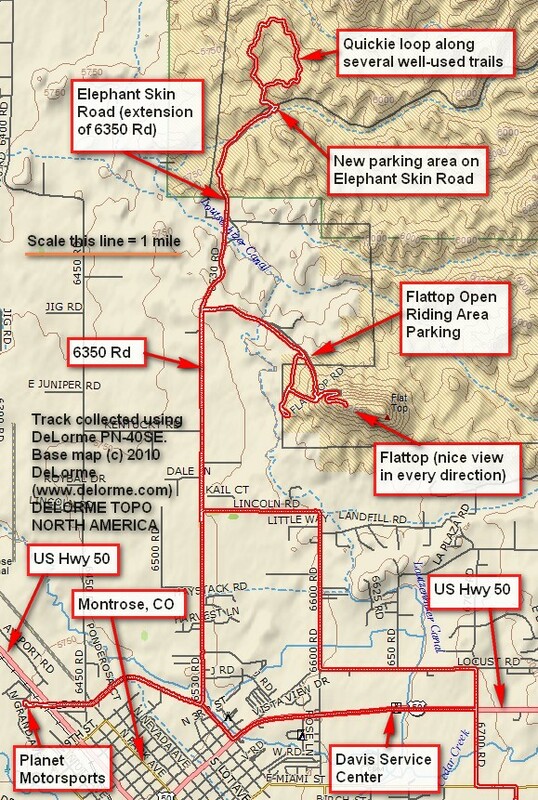 This entry was posted in GPS Tracks, Montrose County, Motorcycling and tagged Colorado, dirt bikes, Gunnison Gorge National Conservation Area, montrose adobes, montrose colorado, montrose county, motorcycling. Bookmark the permalink.